[UPDATE 6/7/2016 As reported by Slashdot News, UK Investigatory Powers Bill passes through the House of Commons. The bill now only has to pass through the House of Lords in order to be signed into law. [UPDATE 3/16/2016] As Telegraph News reports, UK Parliament has passed the IP Bill by 266 votes after hours of debate. Read below what this means for the internet users in the UK and the international web community. At the beginning of March 2016, UK and the rest of the world got a glimpse at an updated Investigatory Powers Bill, otherwise known as Snoopers Charter. It has international significance, as it hopes to set the legal framework for other surveillance laws internationally. However, the rush to pass it and the ignored criticisms has everyone worried. The IPBill has taken some time to get where it is today. You can say it’s been at least 4 years in the making – with the first draft introduced late last year. 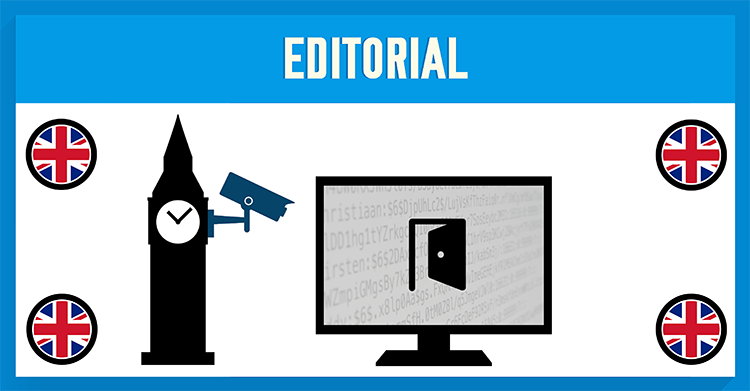 Intended to replace the expiring DRIPA Act, the first draft of IPBill was not met favourably. Three separate parliamentary committees as well as countless MPs criticized it on counts of clarity, consistency, coherence, premise of mandatory encryption backdoors, data collection by ISPs, privacy issues and more. The second draft of the Investigatory Powers bill was presented to the parliament this week. Despite home secretary Theresa May arguing that it reflects the majority of 122 recommendations by MPs, actually extends surveillance powers rather than reigning them in as was hoped. It was more clearly spelled out ISPs would have to store internet connection records, although they have stated the significant costs of doing so would have to be passed down to customers. There would be no need for metadata warrant. UK Mobile operator devices can be subject to backdoor access – if warrant is obtained they will be required to “provide facilities or services of a specified description”. Any operator can be forced to provide literally any service, if it’s within their technical capability to do so, including removal of “electronic protection” (which would includes encryption). Home Office published a number of draft Codes of Practice (six) that explain in detail how the powers will be used and why they’re required. Clarity is still admittedly lacking in hopes of having some elements of the bill function as a ‘live document’ which might change as it is ‘future proofed’. How could IPB affect you? • ISPs will have to keep peoples internet web history for up to a year under the new surveillance bill. As most data retention laws this probably means the collection of metadata, which is not full content of your web and mobile interactions, but enough to composite a profile of your online activity, id who you interact with and when. The content of your online activities is not as important as your online habits, preference patterns in combination with your personal details. That type of information is very valuable. If any of the companies (ISPS + Telcos) or government agencies mishandle internet user information – the cybersecurity breach could become a huge and costly fiasco. With so many stakeholders involved – the likelihood of mishandled data is quite high. • You will end up paying for the program. ISPs and Telcos would incur a lot of expenses in managing the data collection, in addition to costly security measures and administration of government agency requests to access data. Back in 2012 it was estimated that enacting ‘Snoopers Charter’ would cost an estimated 2.5 Billion UK Pounds. The government hopes it will win the backing of MPs by the summer and by the House of Lords this autumn. A VPN encrypts your data through a secure tunnel before accessing the internet – this protects any sensitive information about your location by hiding your IP address. Virtual Private Networks connects you to the internet through an alternative path than your ISP. The only information visible to them is that you are connected to a VPN server and nothing more. All other information is encrypted by the VPN’s protocol. This is handy when you don’t want your real IP traced back to you. All packets exchanged between the internet and your device go through a remote machine used to connect to the host server. The IP address of the proxy server appears to be that of a remote machine, which enables the user to hide their true IP address. However, web proxy does not encrypted your traffic. SOCKS5 is an internet protocol which routes packets between a server and a client using a proxy server. To put it simply – your data is routed through proxy server that generates an arbitrary IP address before you reach your destination. It is a good option for torrenting or P2P, but not web-browsing. Learn more: SOCKS5 Proxy. There a number of email services that are not based in countries that have mandatory data retention laws. However, be mindful of other online data retention and sharing programs out there– pay attention to their privacy policies and the country they are based in.